Participants broke up into small groups for discussions and case studies. 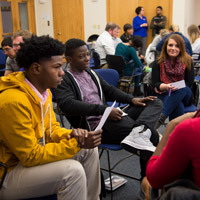 On Jan. 19, Webster University leaders facilitated a town hall with students on Webster's stance and policies and procedures on hate and harassment, followed by small group discussions and case studies. Following opening remarks by Elizabeth (Beth) J. Stroble, president, and Julian Schuster, provost, senior vice president, and chief operating officer, the program included remarks from student affairs and other panelists, discussing specific policies, procedures and opportunities for students to get involved. See their remarks on policies, resources and opportunities for students in this video. 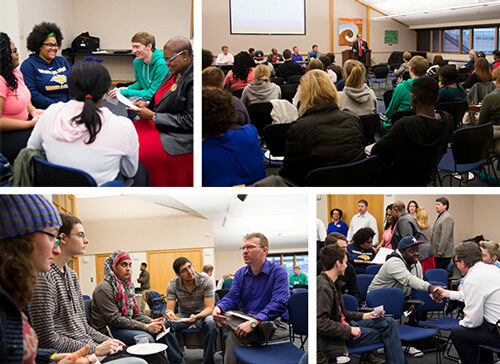 Following opening remarks, the panelists led small group discussions and case studies with students.